Posh historian Peter Lane and his scrapbook detailing the FA Cup game at Aston Villa. Photo: Joe Dent/theposh.com. If Peterborough United hadn’t beaten Arsenal at London Road four years later, the most talked about match among the older generation of fans would have been the trip to Aston Villa for a fourth round FA Cup replay in February, 1961. A crowd of 64,531 packed into Villa Park to see if famous giant-killers Posh could claim another massive scalp. A fifth round tie against Spurs was at stake. Action from Aston Villa v Posh in a 1961 FA Cup tie. Villa had won promotion to the top flight the previous season under manager Joe Mercer, a man who went on to briefly manage the English national side. A huge number of travelling fans attended the game, but many were locked out after arriving late because of traffic issues. Posh historian Peter Lane was one of the lucky ones who made it inside to watch a cracking cup tie. “I was only 15,” Peter recalled. “But I’d been a regular for almost 10 years by then and I wasn’t going to miss this game. Posh player profiles from the Aston Villa match programme in 1961. “The first game at London Road was fantastic. It was played on an absolute mudheap - the game would probably be postponed these days - but both teams played brilliantly. “We took the lead through Billy Hails, but Villa equalised straight away when our centre half Roy Banham unfortunately headed a cross into his own net. “He was really unlucky as he couldn’t get out of the way of a really hard struck cross. “But the replay was even better. We were superb and very unlucky to lose. Peter McParland scores the winning goal for Aston Villa against Posh in a fourth round FA Cup tie. “Every member of the team played really well and we thought we were going to win when Peter McNamee equalised. It must have been one of the best Posh performances of all time. “Unfortunately a minute after Peter’s goal Villa centre forward Peter McParland scored a brilliant goal and we couldn’t get an equaliser. McParland was the difference between the sides. “He was a dirty so-and-so and I think he frightened our keeper Jack Walls for the first goal in the first-half. “It was a great match though and a great experience. I stood low down, right on the halfway line and I had never experienced noise like it. “I travelled on a coach and the route to Birmingham involved the A47 back then. It was clogged with traffic for the entire trip which is why so many Posh fans couldn’t get into the ground when they eventually reached Villa Park. “There were thousands locked outside, although the number increases every time I speak to someone about that day. The last number I heard was 10,000! “I remember there were loads and loads of policemen outside the game on crowd control duty and they were all on white horses. “They weren’t expecting trouble, just a huge number of fans, but 64,000 took them by surprise. “Everyone has a story about that day. Everyone claims they were there! “People talk to me about that game almost as much as they talk about the win over Arsenal. Peter reckons he has missed about 20 home games since he started following Posh in 1952. He doesn’t attend Checkatrade Trophy matches (‘Mickey Mouse football’) or travel away very often (‘fed up with people standing when they should sit’). He is still heavily involved with Posh, regularly arranging for the club’s old players to attend matches at the ABAX Stadium as guests of honour. 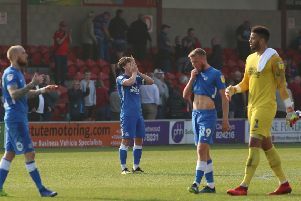 Posh went on to win the Fourth Division title in their first season as a Football League club, pipping Crystal Palace to the title by two points. Posh scored 134 goals in 46 League games which remains a record for the fourth tier of English football. 64,531 v Aston Villa (1961, FA Cup). 63,635 v Chelsea (1965, FA Cup). 56,352 v Manchester Utd (1976, FA Cup). 51,144 v Sheffield Wednesday (1960, FA Cup). 48,735 v Huddersfield (1957, FA Cup). 48,410 v Huddersfield (2011, League One play-off final, Old Trafford). 43,998 v Sunderland (1967, FA Cup). 43,067 v Newcastle (2009, Championship ). 42,782 v Newcastle (1962, FA Cup). 41,003 v Chelsea (2017, FA Cup). Highest Posh home attendance: 30,096 v Swansea (1965, FA Cup). Peter McNamee interview online later this morning.